Description: Based on current American Heart Association Guidelines for chest compression and rhythm, Saving Lives! helps players practice their foundational CPR and basic life support skillsets by administering CPR to a patient in a simulated emergency scenario. Players will internalize the compression rate and proper procedure for CPR, receiving contextualized, just-in-time feedback as patient status changes based on their performance. Players will also gain experience using an automated external defibrillator (AED) to resuscitate unresponsive patients. Skills and Ideas Taught: Foundational CPR and basic life support skillsets. 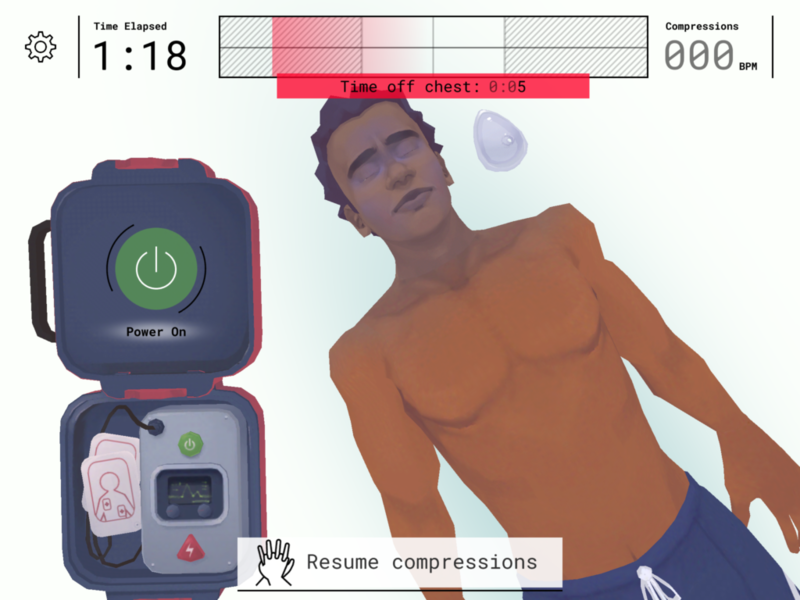 Players are additionally taught contextual best practices such as clearing the scene, having a bystander call for help, and using AED as needed. Goal or Challenge: Saving Lives! helps players practice their foundational CPR and basic life support skillsets by administering CPR to a patient in a simulated emergency scenario. Primary Audience: AppClinic’s Saving Lives! was developed for EMS, medical, nursing and allied health students and professionals, as well as medical and allied health educators. Assessment Approach: Saving Lives! provides contextualized, just-in-time feedback evaluating the quality of each player’s techniques as well as the accuracy of their CPR rhythm.